Hey guys, the heck with the new testosterone foam you spray under your arm. Go see Tom Cruise’s new flick, Jack Reacher. You won’t be suffering from Low-T after this one. Walking out of the theater, my chest had expanded an additional inches. No, I didn’t hit the ground to do 30 push-ups. But I wanted to. Still, there are some issues of importance covered – or maybe touched on — in the film. This is no Oscar winner. It’s a shoot-em-up flick with a great chase scene and a bloody ending. The film fails on a structural level. 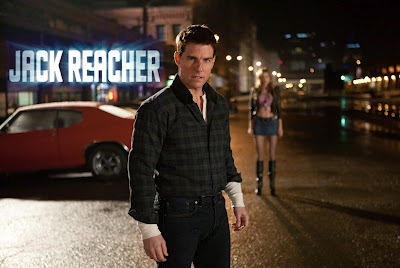 Cruise’s character – Jack Reacher, the hero – does not have a strong or worthy opponent in the dramatic sense. As a result, the bad guy behind it all is rarely seen in the flick. In fact, the hero’s helper – played by a loveable and wily Robert Duvall – has more poignant face time than the so-called dramatic opponent. Of course, this hampers the film’s chances of being memorable. The first 45 minutes provide a decent unraveling of a who-done-it. Pay attention to the victims in the opening scenes. The opening scene was nicely written and edited. There were quick and efficient edits that told the story leading up to the sniper shooting. Cruise is still Cruise. Whatever you think about him and his personal off-screen story, the man still delivers. Cruise’s female lead will grow on you. Rosamund Pike looks like a heady but sultry beauty from the 1950s who would have fit in LA Confidential. Jack Reacher could be the first of a series of films – like Eastwood’s Dirty Harry genre. You understand why the film’s premiere was cancelled around the time of Newtown. The opening scenes say it all. Even I said to myself, “Oh please don’t show that.” The film didn’t deliver my worst nightmare. Still, it was an unnerving few minutes because of what we all have gone through. If you want to avoid films of violence, don’t see this one. It’s not the most violent film you will see, but if these recent real life episodes bother you, I would suggest skipping Jack Reacher. The film is a nice video commercial for the city of Pittsburgh. I am a big fan of Pittsburgh myself since I have family there and I have spent time there. The film does a nice job of showing off the city that has had a Renaissance of sorts. This film hits on some themes that the American psyche might be craving. It seems to be saying we want a leader who is not afraid of the bad guys, who sticks up for justice, and who can keep it in his pants. Clearly, Jack Reacher is an unbiased, sober, doesn’t screw around, the facts-only, kind of guy. He’s really Dirty Harry – but just back from Iraq. He was an investigator for military police in Iraq keeping our forces and military contractors (Blackwater types) on the up and up, but it appeared to be heinous stuff as evidenced by his massive body scars. Jack also has control of his man-tool. The Rosamund Pike character – Helen – is trying to fight off her urge to bed Jack. But nothing happens because Jack is the one with restraint. The film also looks at the returning war vet and the problems he or she faces. Jack has to help a former Army sniper accused of the public shooting. However, the film doesn’t delve into the question deeply, but the film does not offend war vets in anyway. The film does point the finger at an evil business enterprise. Go see it and give me your thoughts. Tax Reform Bill Silver Lining: Time To Start Your Business?